This article gives you complete details about Rage video game which is the latest first person shooter game released in PC, PS 3 and Xbox 360. Read the article till the end for more information about Rage video game. Rage is the latest and best first person shooter game which is released on all plat forms which includes PC, playstation 3 and Xbox 360. Release date of Rage video game is 4th October 2011. Latest technology like OpenGL and id Tech 5 engine was used in this game. 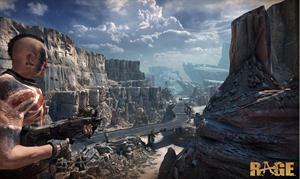 The game play of rage focuses on a future period of 2029. Player will have to play as a survivor role. Rage is a RPG - role playing game which includes latest weapons and inventory. Rage also includes multiplayer gaming mode. The game has got excellent reviews and ratings. The developer of rage video game is id software. The publisher of Rage game is Bethesda Softworks. Rage game has got excellent graphics and technology. More details about the system requirements and ratings of Rage video game is given below.